In 2013, at the age of 43, my life was at a turning point. A recent separation from my wife of six years had left me with coping with sadness and anxiety. My health had deteriorated as well, which lead to my doctor diagnosing metabolic syndrome. The CHANGE Program helped me regain my energy and a positive outlook on life. After 12 months, I had reversed the criteria for MetS and reinvigorated myself mentally and physically to take care of my five children, work more effectively as a manager at a local police station and pursue personal interests. A big part of my success with the CHANGE Program was the running regimen the health professionals designed for me. Running was a new experience. I had practiced a few sports like karate and soccer, but had been inactive for nearly 11 years. But over the course of the 12-month program, I gradually improved, which gave me an important sense of accomplishment and progress. 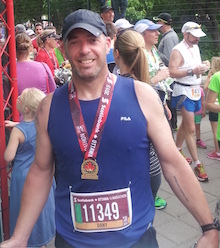 I successfully completed several run challenges: in May 2015 I finished my first half-marathon, and the following September completed another, improving my time by 4 minutes. I never thought I'd be able to run 21 km, but with the support of CHANGE, I did it!